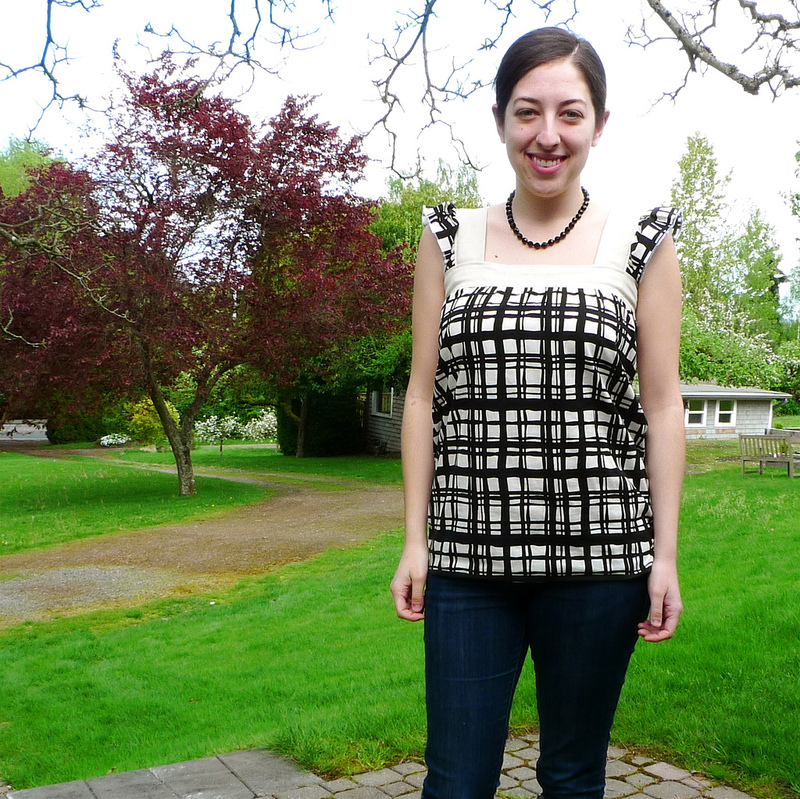 I finished another top for the Pattern Challenge! 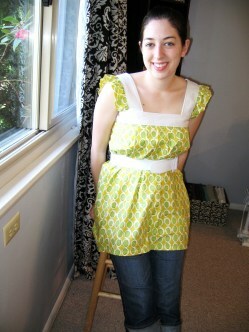 I’ve been having too much fun sewing clothes for myself, I’m worried I might turn into the Selfish Seamstress!! 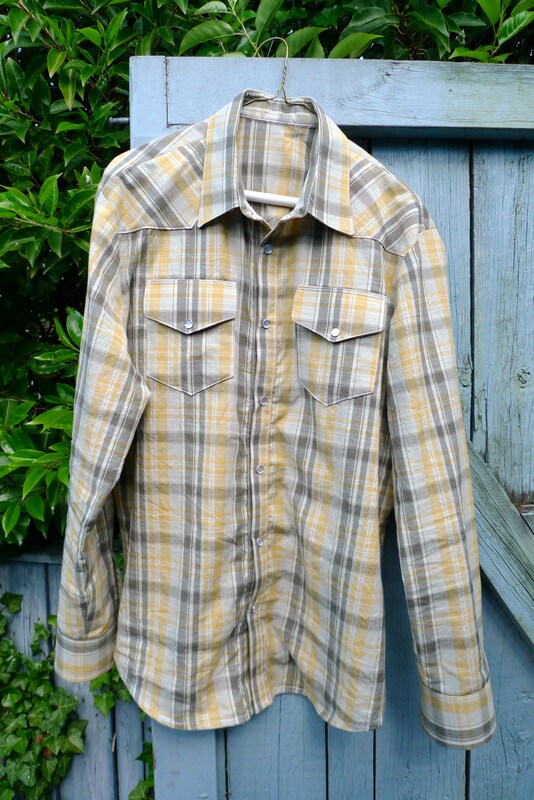 Does anyone recognize that fabric? It’s the ever lovely and luscious Liberty of London in Dunvina. I purchased it when I was in London at Shaukat Fabrics (they have a humongous stock of gorgeous Liberty prints at the best prices I’ve seen, you can order them online). 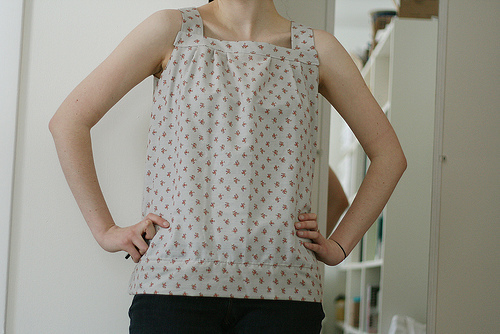 I only purchased 3/4 metre, which was just enough to make the body/sleeves of this top. 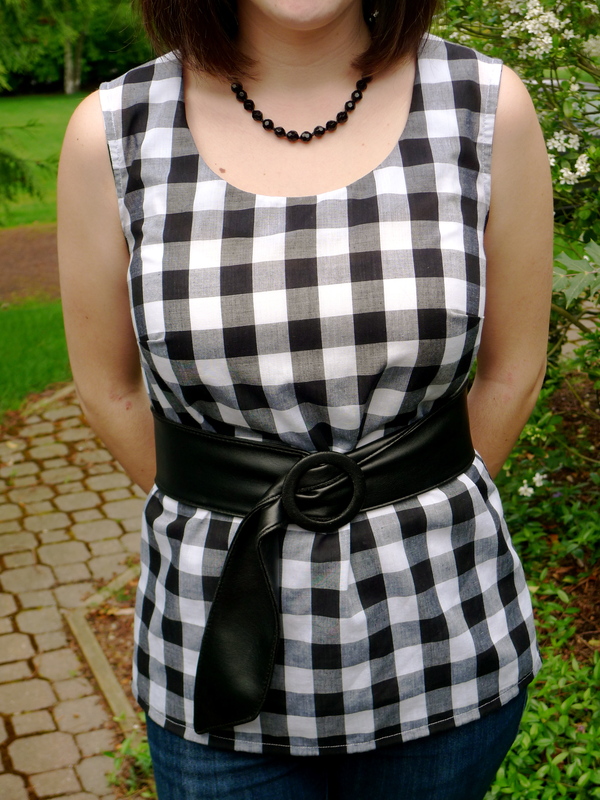 I had originally envisioned the collar made out of the same fabric, but alas, I ran out. 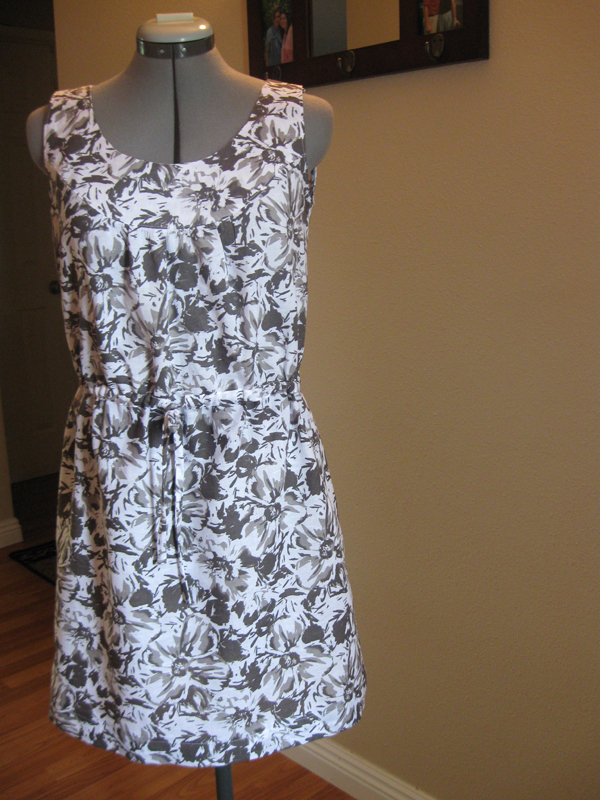 Instead a used a beautiful cotton/sateen by Robert Kaufman. 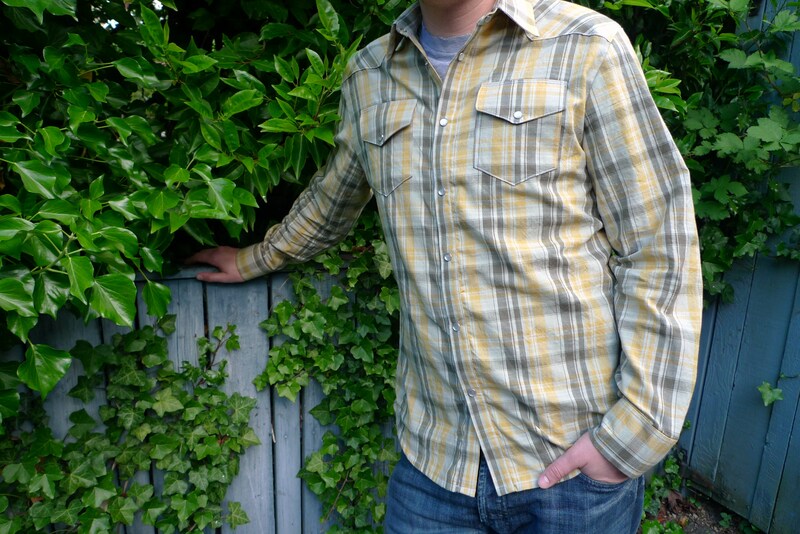 I used the basic top and sleeve pattern from…you guessed it….Simplicity 2599 (are you guys majorly sick of this yet?) 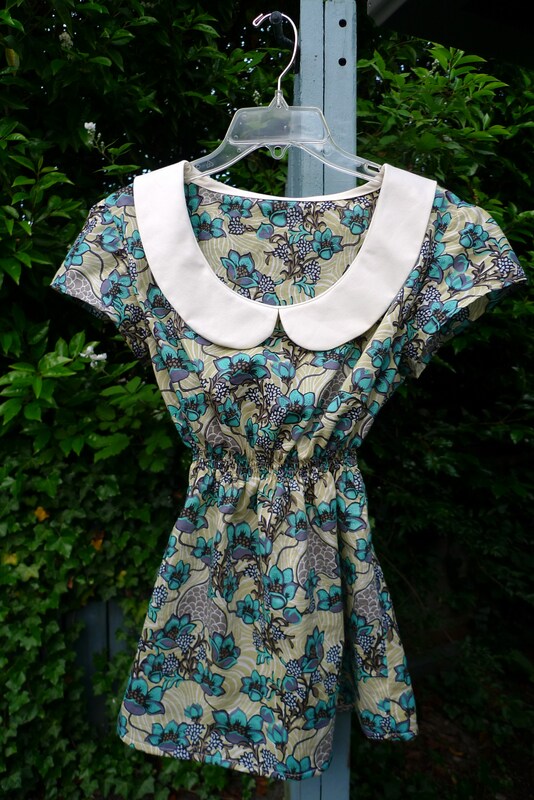 and added a self-drafted peter pan collar. 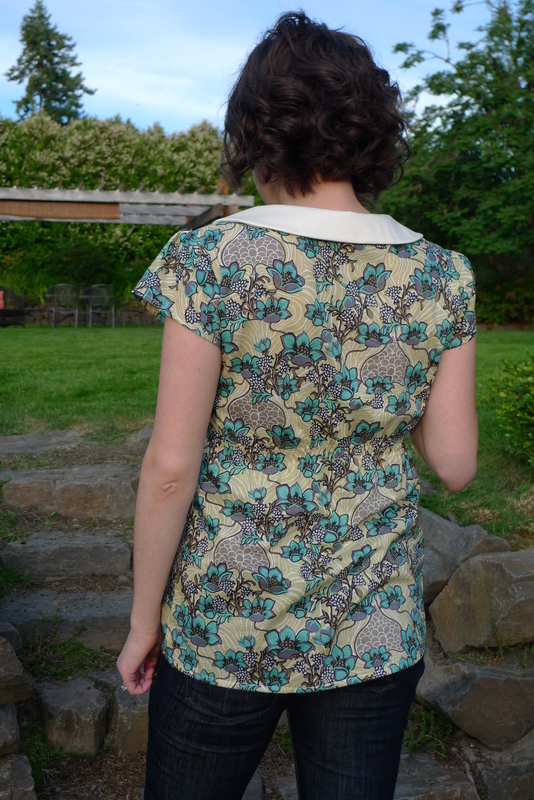 The collar is the sweetest accent and it was so much fun to make! 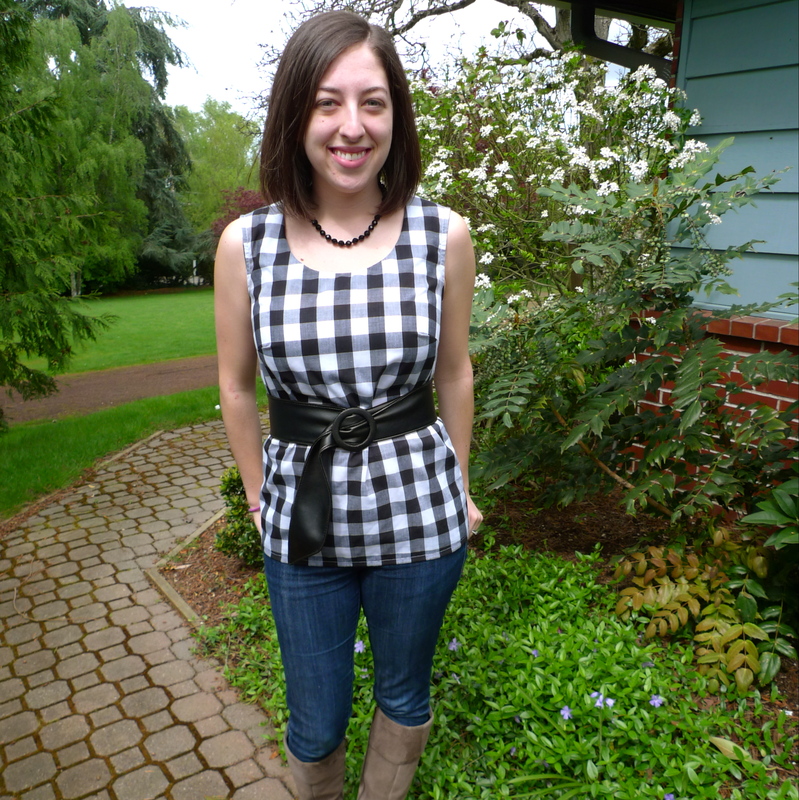 I used this method for attaching the peter pan collar, and it worked out perfectly! If you do decide to use that tutorial, the one part that confused me was what width of bias tape to cut. In the tutorial she says to use a 1.5″ folded bias strip, which I took to mean cut a strip 1.5″ and fold it in half. 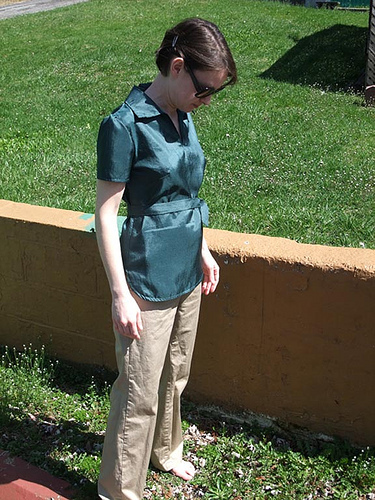 This leaves you with a 3/4″ bias strip, which is fine, but when you go to sew it on you’ll need to use a about 1/4″ seam allowance in order to have enough to fold to the back and topstitch (rather than the 1/2″ seam she instructs you to use). Other than that one point of confusion, the tutorial was great! 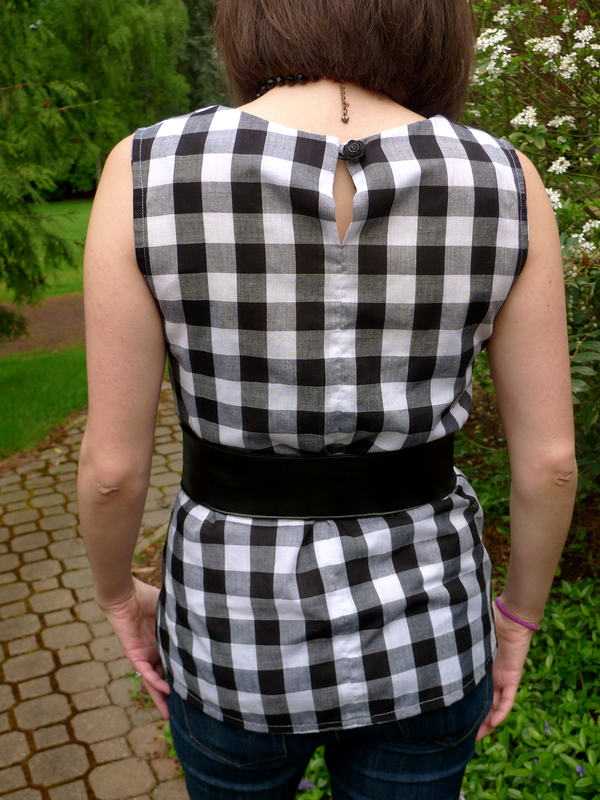 To give this top some shape I used elastic thread to shirr 3 rows under the bust. 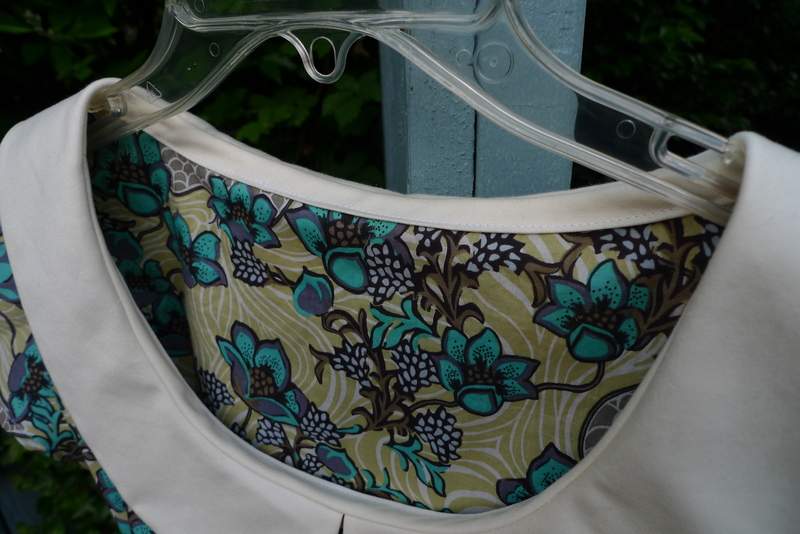 I love that the inside looks as finished as the outside with serged raw edges and the bias tape cover around the neck. It also doesn’t hurt that there really isn’t a wrong side to this fabric! Oh my, wouldn’t this make the sweetest dress? 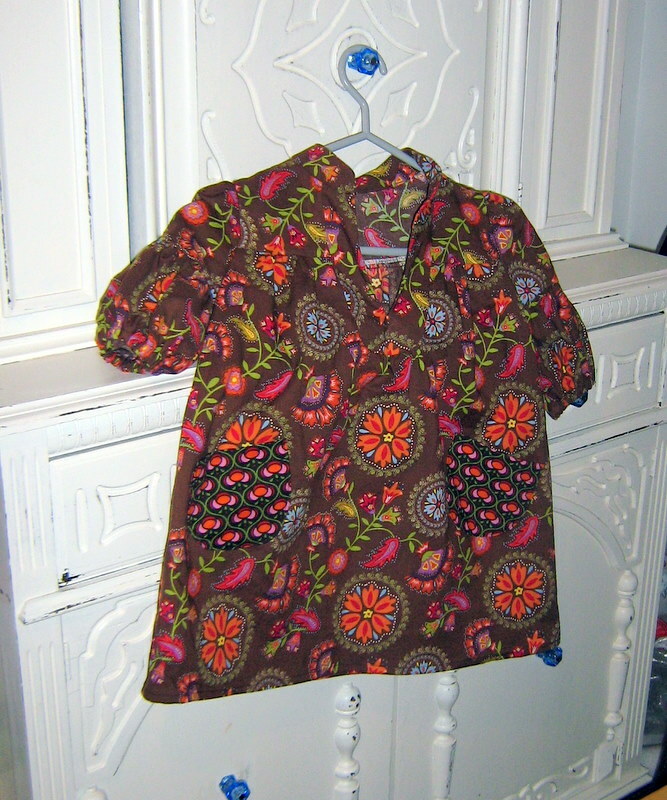 I just barely scraped this top out using what little of this fabric I had. 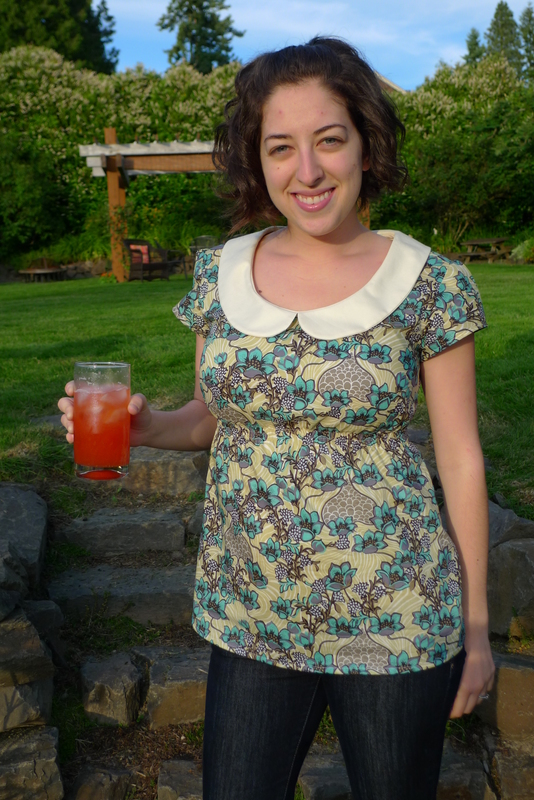 My sister originally bought the fabric for an Anthropologie knock-off top she made (maybe I can get her to send me a photo, it’s adorable!) and she gave me what she had left over. 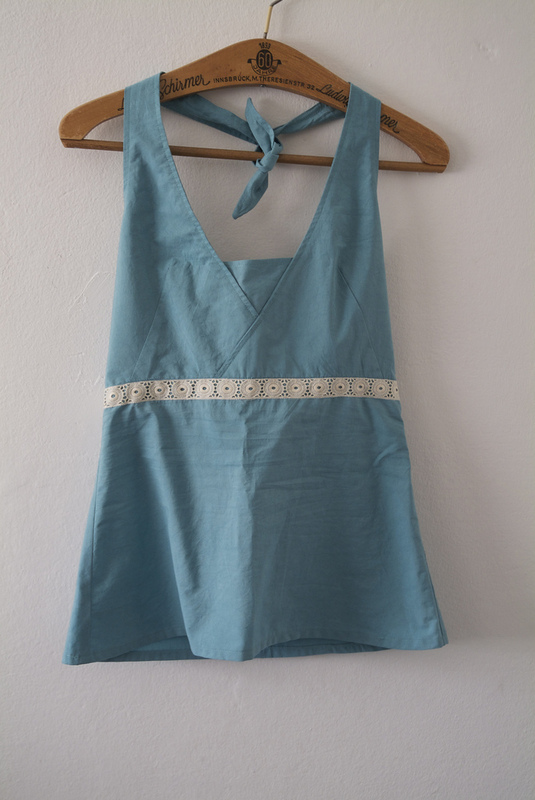 To make it work, I had to omit the adorable pleats at the top (maybe a good idea considering my…ahem…*larger* bust size). 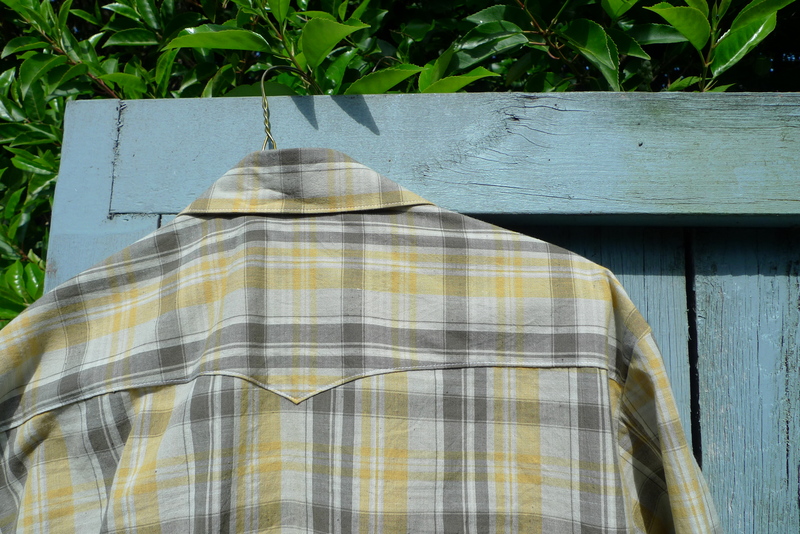 For the straps and chest yoke, I used a natural colored Essex linen/cotton blend. One of my favorite fabrics to use, especially in quilting. Sorry for the crazy amount of clothes-making posts lately. Am I losing all my dearly loved quilty followers? I promise I will get back to quilting soon enough! I’ve got one in progress right now (well, I say that but it’s been almost finished for about 5 months now, just needs binding!). Is anyone interested in our Europe itinerary? I’d be happy to share, if anyone out there is curious. 3 days!!!!! P.S. 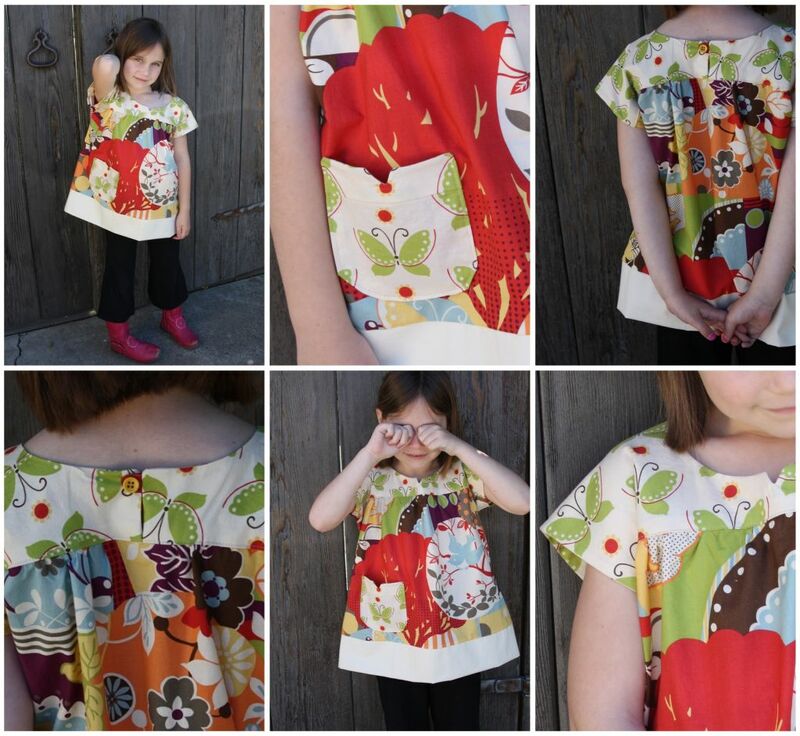 I entered the first top above, along with these two, into Made By Rae’s Spring Top Week. 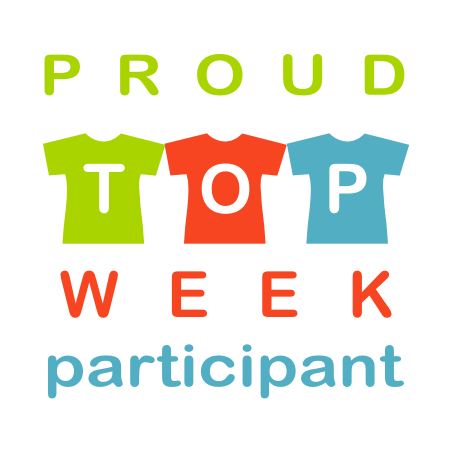 Don’t forget to Vote for your favorite starting next week!! 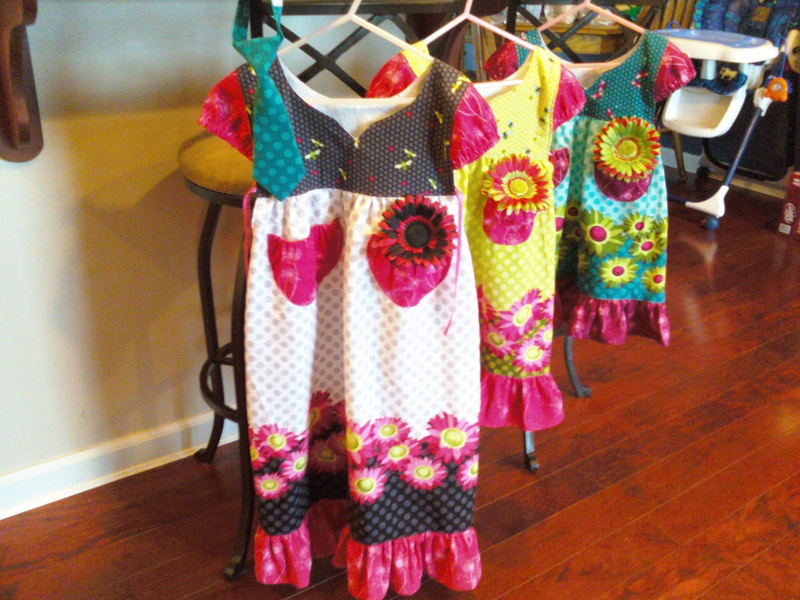 And guess what pattern….you’ve got it! 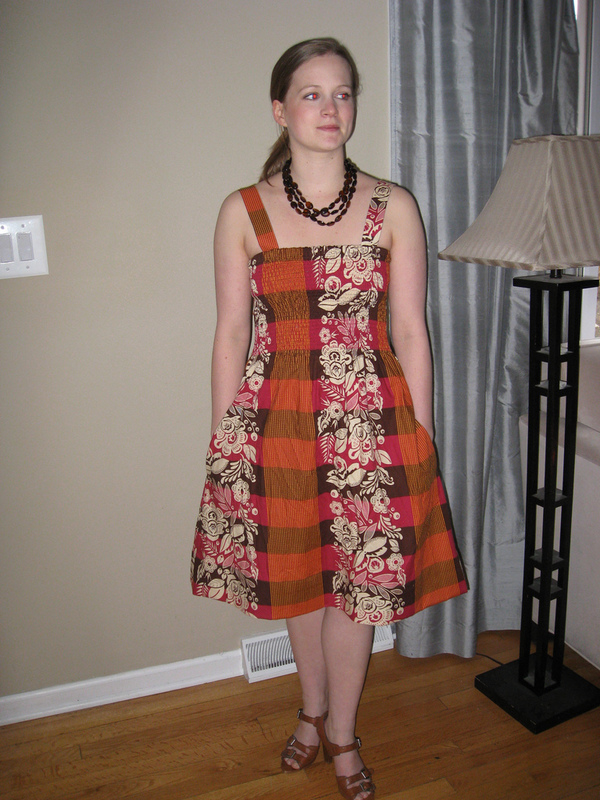 Simplicity 2599! Boy do I love that pattern. We leave for Europe in exactly one week. I’m so excited!! During the three weeks I’m gone I’ve got some SUPER awesome guest bloggers lined up to share some tutorials, tips, links and perhaps a recipe or two. 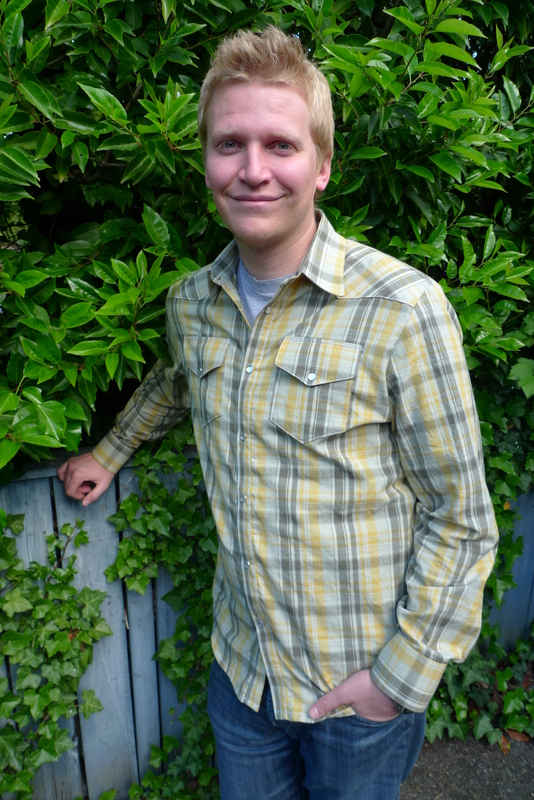 Who knows, this blog may be more happenin’ in my absence than when I’m here!!! I’ll check in one more time before I go. 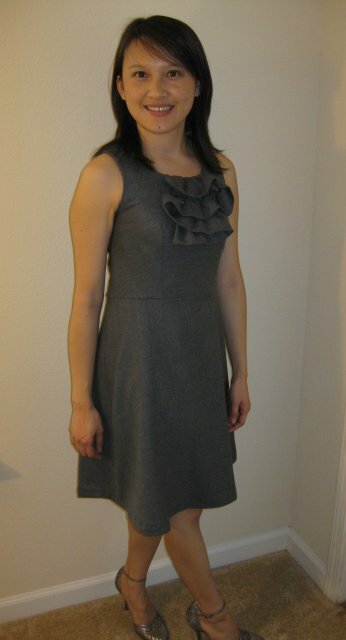 Here is the J.Crew inspired dress that I made using Simplicity 2599. 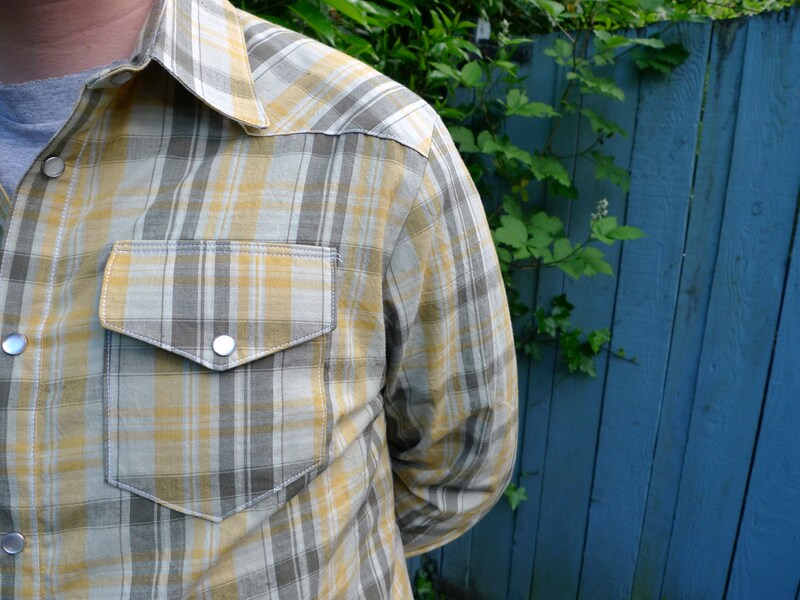 I lengthened the shirt by about 10″ (and then shortened the hem later when it was still way too long), added the sleeve option and made the same adjustments to the pattern that I made last time. Wow, next time I should really iron it first, huh? Well, here’s the dress after sitting through church on Sunday. 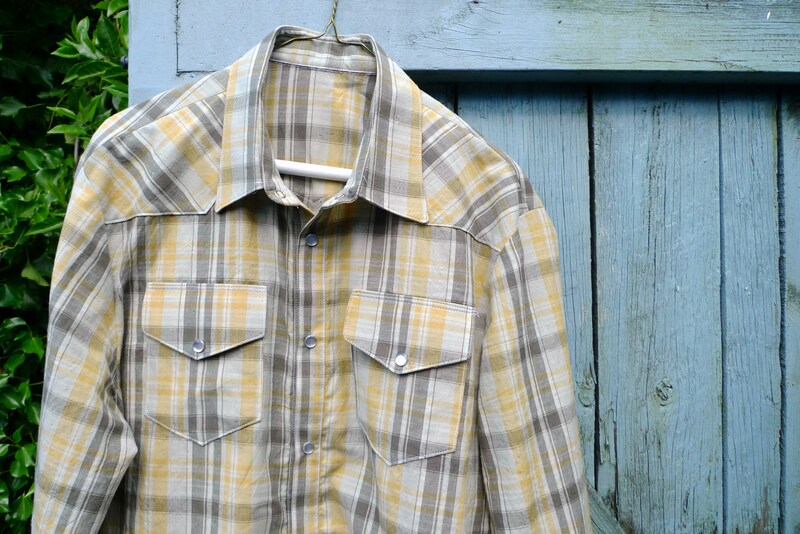 Imagine it with the darts and creases nicely ironed. 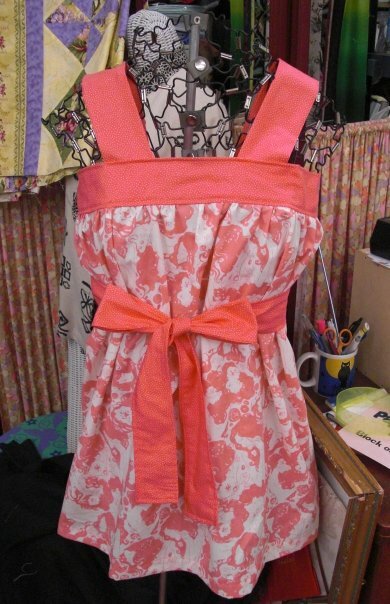 To make the braided neckline and belt, I just took 3 pieces of my fabric and sewed them together at one end. 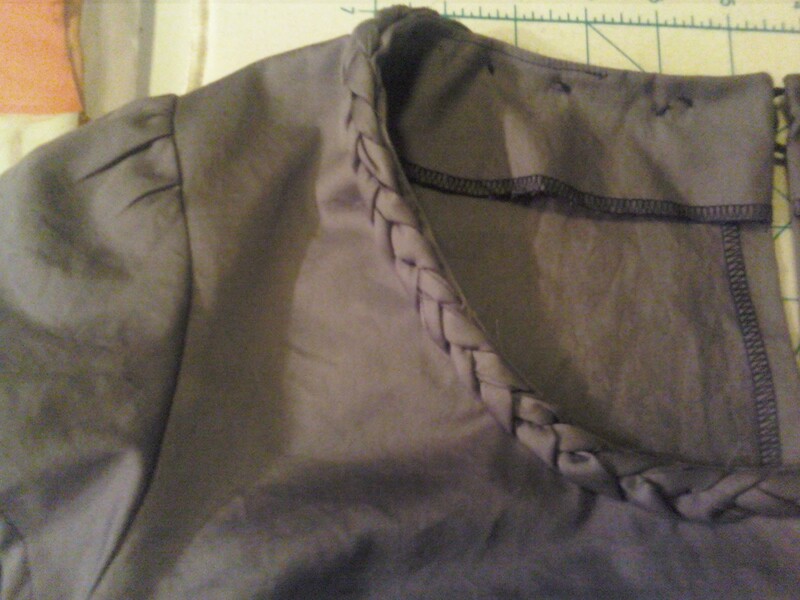 Then I just braided them tightly and tacked it down every 1/2″ or so onto the neckline. The belt is not attached so I can switch it up whenever I like.